MAKE A DIFFERENCE Your work life can reflect both your love of Art and Desire to share it with others through teaching visual art to K-12 students. COURSES HELP YOU PREPARE In studios, perfect your skills in a variety of media; in art history, gain cultural and historical context. Through our liberal arts core, learn to research, write, and use foreign language. Begin to gain experience in K-12 art classrooms and other youth programs your very first year. On campus, work with Art Rocks Kids (ARK) – after school and Saturday art classes for community children, directed by an experienced K-12 art teacher. Off campus, volunteer with the Boys and Girls Club, the Milton Porter School for children with special needs, and other local programs. The many hours in schools attached to teacher and art education courses make our art education candidates more prepared and sought after by employers. And our art ed courses are taught by successful, active or recently retired art teachers - not by scholars primarily interested in theoretical aspects of art education. 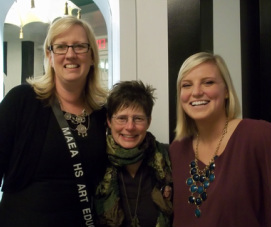 We have a student chapter of Michigan Arts Education Association and out students attend MAEA;s state conference. EMPLOYERS IN THIS FEILD LOOK FOR self-starters who are patient, upbeat, and fairly outgoing, and who enjoy working closely with children and other adults- administrators, colleagues, parents. Artist competent in many different media, with both 2-D and 3-D skills, will likely find a first job faster. Artist with very strong preferences for media like photography, ceramics, sculpture, fiber, or metals often fit best at a large art department in a bigger high school. Successful teachers can organize a classroom and plan a curriculum and are absolutely reliable, timly and present. Keeping your certificate requires ongoing training, and most build into a master’s degree. Associated fields include art center or museum education (teaching program direction), youth camp/organization counseling or administration, community college and college-level teaching with master’s, writing/editing educational materials, teaching workshops as an entrepreneur. 105. Art for Elementary Teachers (3). The development of familiarity with various materials and techniques for use in the elementary classroom, working in paper-maché, mosaic, crayon, chalk, paint, basic printing processes and clay. (Open only to students pursuing the planned minor in elementary education or the early childhood minor.) Fall, May term. Classroom experience observing and assisting an art teacher. Students must enroll concurrently in TED 204 Educational Psychology. Students are required to maintain journals of their experience. (Co-requisite: TED 204.) Fall, Spring. 360. Methods for Elementary Art Teachers (3). Teaching art at the elementary and middle school levels, including advocacy, art education theory and interdisciplinary education models. Teaching and organizational challenges of art education and the problems of creating an age sensitive curriculum. (Co-requisite: Art 361. Prerequisites: acceptance in teacher education program, junior standing.) Spring. 361. Elementary Art Practicum (1). Field experience teaching art to elementary students. (Co- requisite: Art 360. With respect to teacher certification requirements, this can substitute for one hour of T ED 300.) Spring. 460. Methods for Secondary Art Educators (3). Art education theory, resources and classroom management related to secondary teaching. Development of lesson plans into whole units of study culminating in the creation of an entire curriculum and a written personal philosophy about the teaching of art. Additional field experience required. (Prerequisites: 360. Co requisite: Art 461) Fall. 461. Secondary Art Practicum (1). Field experience teaching art to secondary students. (Co-requisite: 460 With respect to teacher certification requirements, this can substitute for one hour of T ED 300.) Fall. 489. Senior Research in Art Education (2). Classroom discussions about the practices of teaching art. Research and reflective writings will prepare the pre-associate teacher by focusing on teaching diverse learners in diverse contexts, is- sues of curriculum and pedagogy, and school culture and art teaching (Co-requisites: ART 360, ART 460, or TED 400.) Spring. 499. Advanced Experimental Course (1-3).